How does Tallyfy differentiate from other solutions? 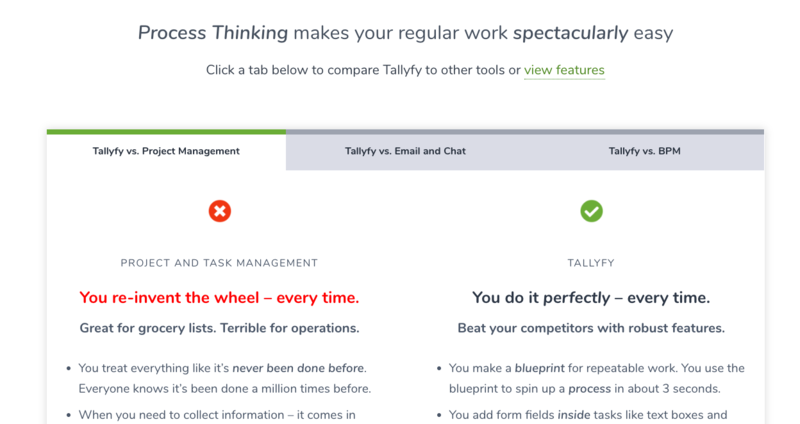 Generally speaking - Tallyfy enables you to practice process thinking - which is very different to chat/email/tasks/projects. Human-centric – Tallyfy is designed to be human-centric. You don’t need to be a developer or need an IT department to implement Tallyfy. In fact, a non-technical user can learn in within minutes. Powerful – We realize that processes do not always follow the same path. Tallyfy’s tasks and processes can have rules built in such as, conditional branching to account for this and make processes flexible. This means your messiest processes can be easily built out in Tallyfy. 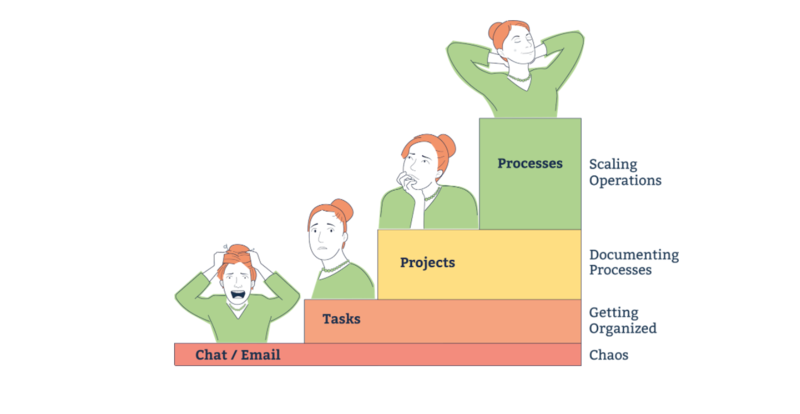 Dynamic – We realize that some tasks often depend on other tasks. Tallyfy has dynamic deadlines to account for such work. You can also create one-off tasks for personal to-dos or add to a process. Connected – Tallyfy has an open API, meaning it integrates to or from any other system a business may be using. You can keep your existing systems. Collaborative – We understand that you do business with people outside your organization. You can invite non-paying guest users (like clients, suppliers, freelancers, etc.) to simply track or complete work within your processes without forcing them to create an account. Insightful – We help you continuously improve. Tallyfy can give you insights and early warnings into what causes bottlenecks in your workflows. You can also edit your processes at any moment, and your team can provide feedback as they go through processes. Supportive – You have our support. Tallyfy has a US based team ready to answer your questions and make sure you are successful with our product. We also love hearing feedback from our customers and actually work to act on these needs. Expert –Tallyfy was created as a result of the founders facing process and scaling problems in companies they worked in. Our team has first hand process pain process improvement experience across numerous industries, including Six Sigma Black belt, Lean and Kaizen expertise. More about our team and mission is here. Please visit our publication for a comparison of enterprise BPM systems. Please take a look at our features page which details all the capabilities. To see Tallyfy in action, book a personal demo with an expert here.